Federal land managers released all 400 head of cattle rounded up on public land in southern Nevada from a rancher who has refused to recognize their authority, citing "escalating tensions." The Bureau of Land Management issued a statement Saturday afternoon after militia members and others gathered near the roundup site to protest the removal of hundreds of Cliven Bundy's cattle. "Safety has always been our number one priority, and the Bureau of Land Management and the National Park Service appreciate the support of those who called for a peaceful conclusion to the operation," the statement read. The cattle had been gathered during the roundup that began a week ago, short of the BLM's goal of 900 cows that it says were trespassing on public land. Bundy didn't immediately respond to a request for comment. In an interview broadcast Friday on "CBS This Morning," Bundy said, "The money's not the deal. The cows are not the deal. It's freedom and liberty and access to our land and get rid of this abusive government." Earlier Saturday, after federal officials abruptly ended the roundup, Gov. Brian Sandoval, who had complained about the BLM's handling of the situation, issued a statement praising the agency for its willingness to listen to the state's concerns. The dispute that triggered the roundup dates to 1993, when the BLM cited concern for the federally protected tortoise. The agency later revoked Bundy's grazing rights. Bundy claims ancestral rights to graze his cattle on lands his Mormon family settled in the 19th century. He stopped paying grazing fees and disregarded several court orders to remove his animals. BLM officials say Bundy now owes more than $1.1 million in unpaid grazing fees. "I'm seeing a lot of passionate Americans willing to stand up for important rights," said Nevada state Assemblywoman Michele Fiore. 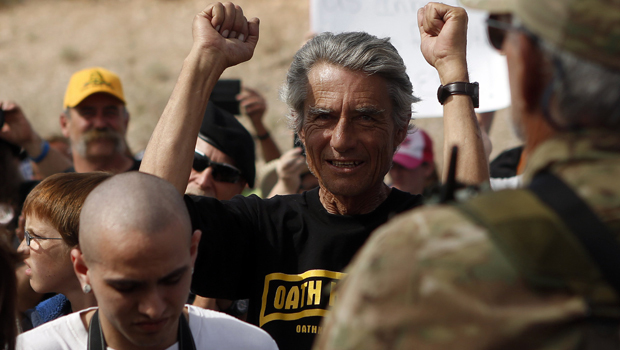 Fiore, a Republican, said Friday she has been making the 80-mile drive from Las Vegas to a growing tent city of militia members, advocates and protesters in dusty but scenic rangeland near Bundy's ranch, just east of the Virgin River. She said she was horrified that BLM police used stun guns on one of Bundy's adult sons during a Wednesday confrontation on a state highway near the Bundy melon farm in the Gold Butte area. Video of that confrontation has spread on the Internet, along with blog commentary claiming excessive government force and calls to arms from self-described militia leaders. Some have invoked references to deadly confrontations with federal authorities, including a siege of a ranch home in Ruby Ridge, Idaho, in 1992 and the fiery destruction of a religious compound near Waco, Texas, that killed 76 people in 1993. In Arizona, state Rep. Bob Thorpe of Flagstaff said he and state legislators were upset the BLM initially restricted protesters to so-called free speech zones. After the areas were removed Thursday, Sandoval issued a statement. "Although tensions remain high, escalation of current events could have negative, long lasting consequences that can be avoided," it said. Amy Lueders, BLM state director in Nevada, said Friday that two protesters were detained, cited for failure to comply with officers at a barricade on Thursday and released. That brought to three the number of arrests. Bundy's son, Dave Bundy, was arrested Sunday on State Route 170 and released Monday with citations accusing him of refusing to disperse and resisting arrest. Lueders declined to provide a cost estimate for the herding operation.